While on your Downtown Las Vegas bar crawl, make a goal to experience some amazing handcrafted cocktails and a variety of craft brews. With Fourth of July nearing, take inspiration from the local bars and pubs to make your own Independence day beverages. 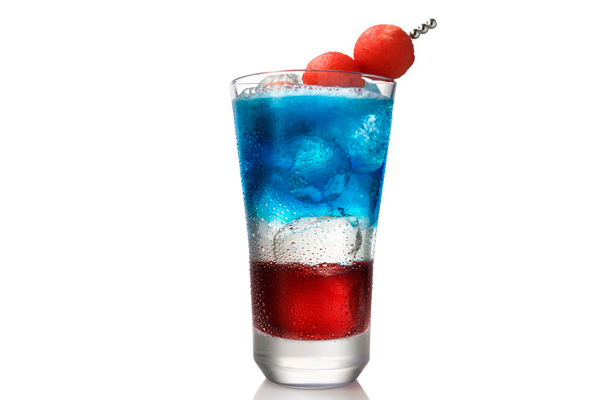 Give your favorite cocktails a patriotic twist and impress all of your friends and family this holiday. At Vegas Pub Crawler, one thing we can appreciate is a well-made cocktail with a theme. Here are five recommendations for Fourth of July themed drinks to try this holiday weekend. Sangria makes for a perfect mixed drink to take to a BBQ or block party. With only a few ingredients, you’ll create a pitcher of refreshing and crisp wine that the entire party will be able to enjoy. Turn your Sangria patriotic with the “Red, White and Brew” recipe. First, in a pitcher, add one cup of halved strawberries and blueberries. Next add one whole bottle of white wine, one cup of triple sec and one-half cup of lemon juice. Lastly, top it off with club soda and serve it up to thirsty partiers. Fourth of July remembers the long fought battle for independence from the British. Celebrate this freedom with a Patriotic Gin and Tonic. This traditional English drink has only two ingredients: gin and soda water (ratio depends on taste preferences). Simply add raspberries and blueberries to get the signature red, white and blue theme. You simply cannot have a picnic or BBQ without a refreshing lemonade (that just wouldn’t be American!). Kick up your lemonade with this alcoholic twist. Grab a pitcher and fill with six ounces of your favorite vodka (we recommend flavors like raspberry, lemon or another fruity kick) and fill the rest with fresh lemonade (make it yourself or buy from the store). Throw some ice cubes and fruit in, if you wish. Take a cooling sip and celebrate America. This cocktail may take some time and finesse to create, but if done correctly will be one worthy of Instagram. First, add one ounce of watermelon Schnapps and one-half ounce of cranberry juice over ice. Next, carefully add one and a half ounces of vodka and one-half ounce of simple syrup and lemon juice. Lastly, slowly add blue curacao to achieve the color separation and top with soda. Even if the color doesn’t come out perfectly, it’ll still taste delicious. If you are not a fan of handcrafted cocktails and like to keep things simple with a cold brew, we have you covered as well. While you may be tempted to reach for the newly branded Budweiser (now called America), kick things up a notch with a craft brew. On your Downtown pub crawl, check out 21st Amendment Brewery. They have a huge selection of beers that will please all tastes and preferences. Before you whip up some fancy cocktails for your friends this Fourth of July, take a pub crawl in Downtown Las Vegas on our giant cycle. Vegas Pub Crawler currently offers the promo code “Summertime” to book a bar crawl for only $20 a person. After all, it’s research for your Independence Day BBQ, right? We’ll see you downtown!